System administrators will see navigation for Administration within the left navigation which looks similar to the following. From this window, many of the administrative processes for Project Insight can be initiated. 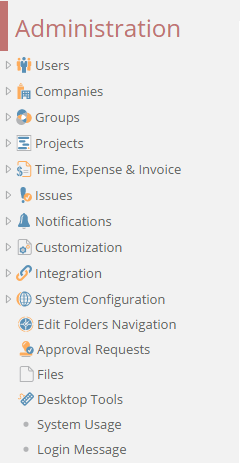 Many administrative functions can also be initiated through convenient links located throughout Project Insight and your content folders, such as Item Permissions and Item Properties.